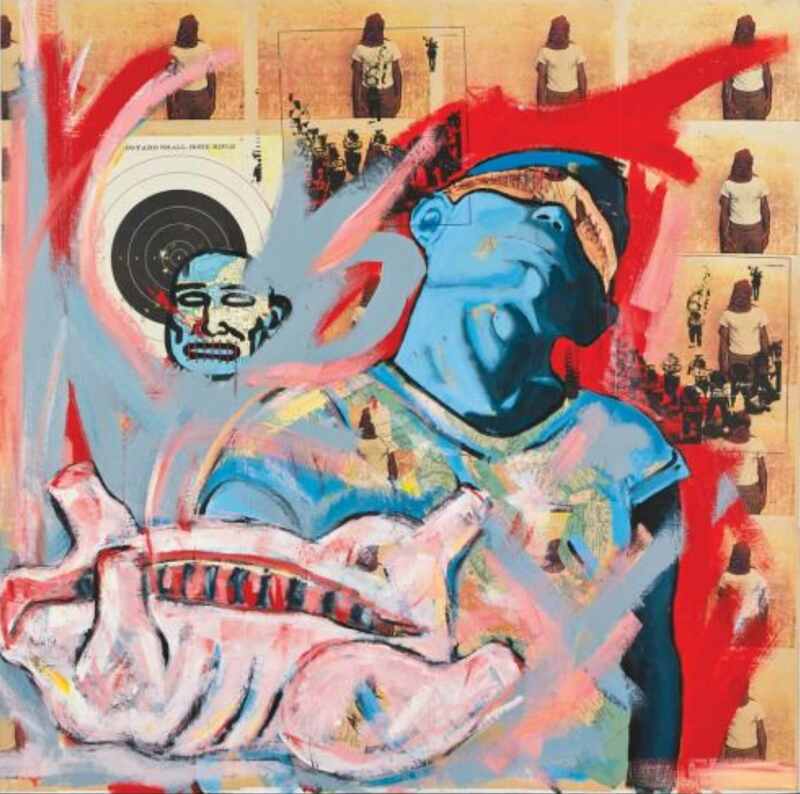 David Wojnarowicz was one of the most important voices of his generation. Now known equally for his art and his writings, Wojnarowicz illuminated the terrors and struggles of the outsider—eventually exposing the universal terror of our existential reality. Going further, he deconstructed this paralyzing state, thus disarming these same demons and revealing the ultimate truth that storytellers such as himself—abused as a child and attacked in modern America as a homosexual man—can emerge with the power to unmask the mechanisms of alienation and oppression that have become part of everyday life. East Village Eye was one the first publications to cover the progress of this extraordinary artist, and we are honored that he chose the Eye to write a column in which he addressed some of his major themes, as well as the lives and work of fellow artists and others who lived near his home in the Lower East Side of New York City. You can read articles by and about David Wojnarowicz by visiting the Archives page of this website. MOVE militant Debbie Sims Africa was recently released after serving 40 years for the murder of a Philadelphia policeman. See a video here for a report from The Real News that references a cover story in the East Village Eye back in June of 1986. 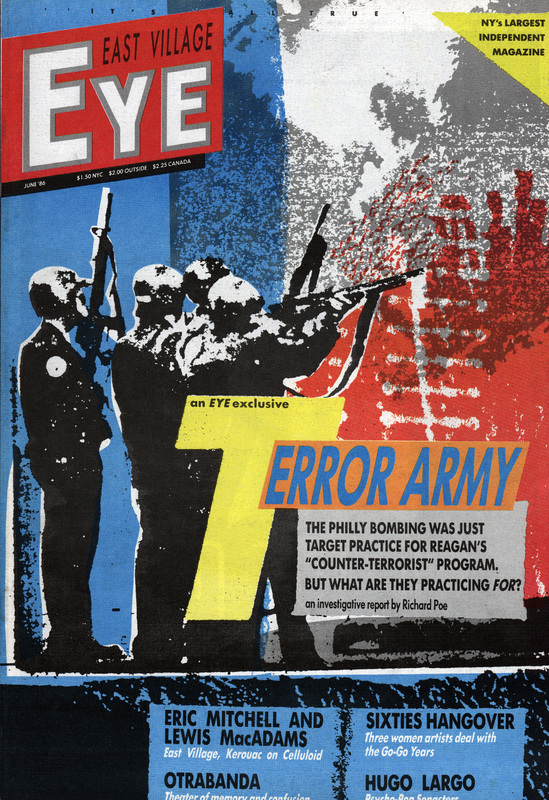 For the full story of the bombing of the MOVE compound in Philadelphia that wrought major destruction upon the neighborhood that housed the group's HQ, read the Eye's June 1986 issue. Just in time for summer reading, The Eye Archive is proud to present the Ten Most Musical Eyes, featuring some of our favorite idols, inconoclasts and idiosyncratic troubadours who changed the ears of a generation. Join us as we get into their heads and reveal what they had in mind when they revolutionized the soundtrack of our lives. The mega-show we've been waiting for will open at Howl! Happening at 6 East 1st Street in New York City on September 16th, 2016. 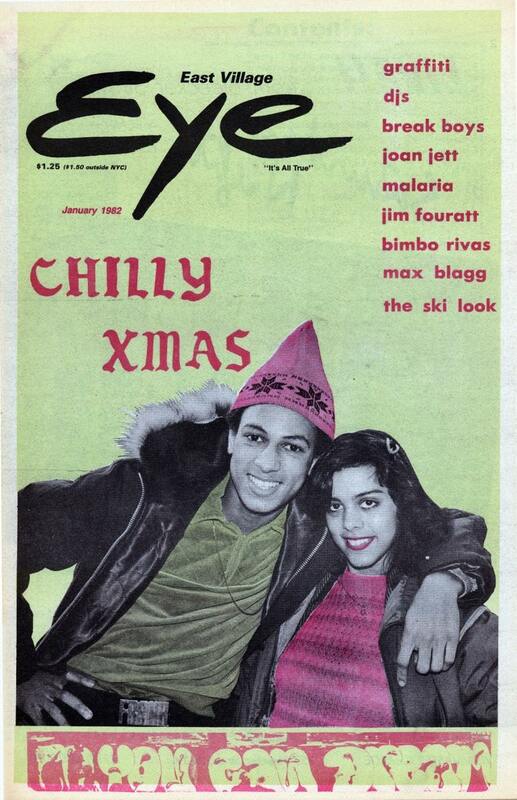 "It's All True": The East Village Eye Show will feature covers, centerfolds, interior pages, ephemera and photographic prints drawn from the extensive East Village Eye Archive, as well as key art pieces from the era, and will be augmented with readings, performances, film screenings and a panel discussion. 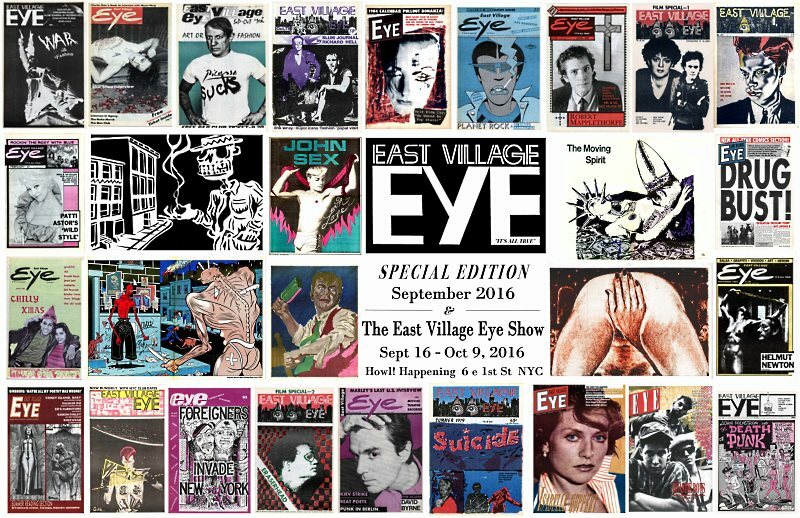 In addition, we're printing a Special Edition of the East Village Eye that will include the show catalog. The one and only James Chance. 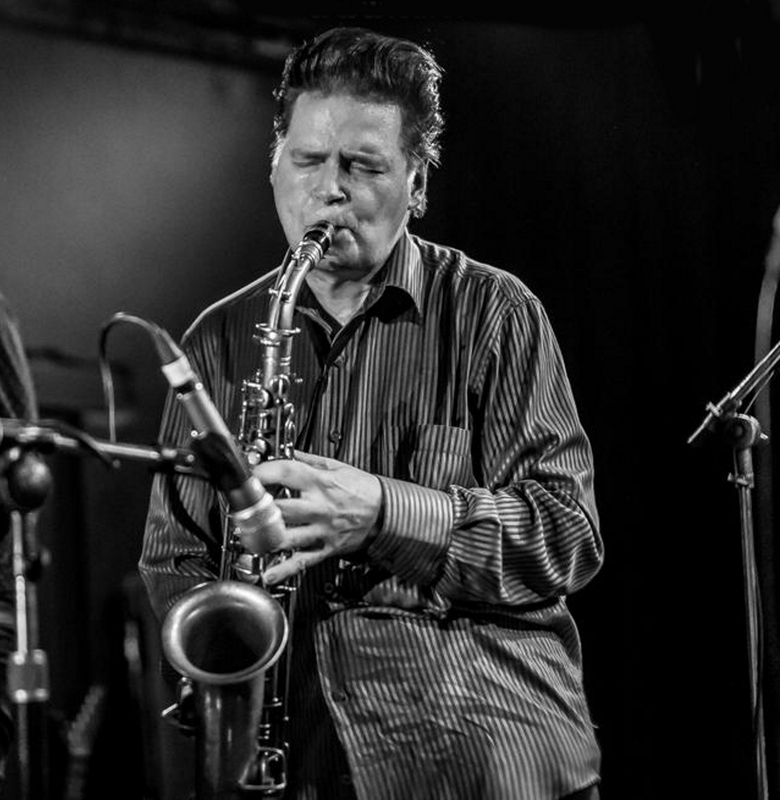 James Chance, the legendary No Wave Punk/Funk pioneer who graced both the first and last covers of the East Village Eye, will bring his Contortions to The Delancey, a leading Lower East Side club, for a full one-hour set on Friday, September 16 at midnight, following the show's opening at Howl! Happening from 6-8 pm. James, who promises to "blow down the doors," will be playing fave classics plus previewing songs from his upcoming album, "The Flesh Is Weak." 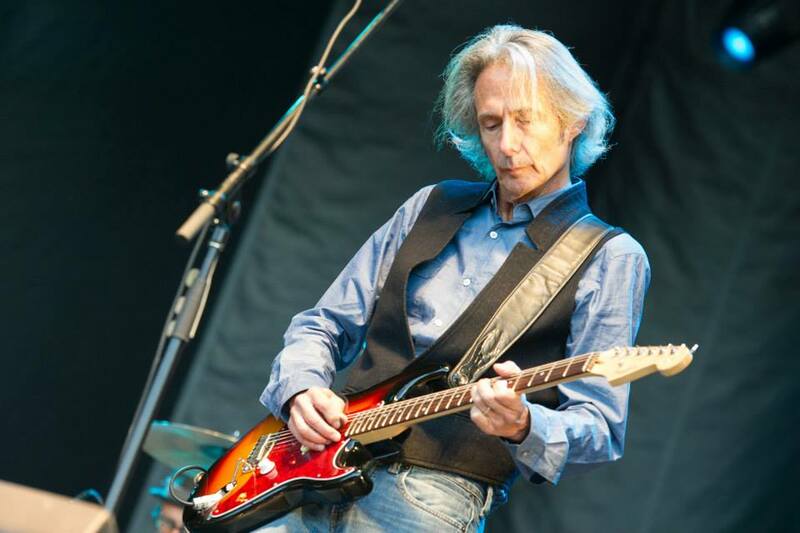 We are pleased to announce that Lenny Kaye, the acclaimed singer, songwriter and guitarist who first gave music to the poems of Patti Smith and is an accomplished artist in his own right, will be performing at the East Village Eye party. Also featured onstage are the Sic F*cks, dyed-in-the-wool punk rockers from back in the day who are still tearin' it up. As always, the Sic F*cks include the lovely and talented Tish & Snooky Bellomo of Manic Panic. Your host for the evening: comedienne extraordinaire Tessie Chua, who will be flying in from San Francisco for just for the occasion. And special guests, so watch this space! Mother Superior Tessie stands between naughty novices Tish & Snooky. The Delancey is at 168 Delancey Street in Manhattan, right at the entrance to the Williamsburg Bridge. Mere steps from the Essex Street subway stop (J/M/Z/F), or a 10-minute walk from Howl! Happening. 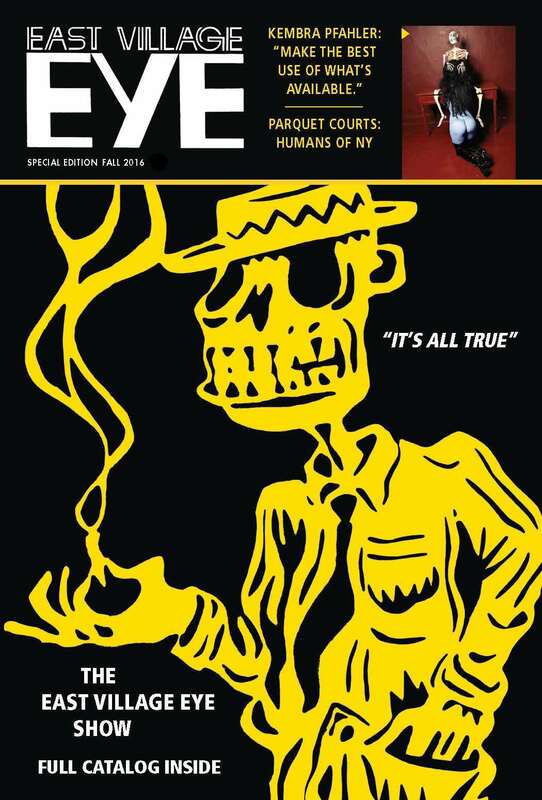 East Village Eye - Special Edition, which covers everything in the Show and so much more, is hitting the street as we speak. The tabloid-sized magazine includes not only historical perspectives but brand-new articles on the people and events that are impacting our world today, plus music, commentary, fashion and more. Plus, it includes the entire catalog of the East Village Eye Show, with essays and articles by Leonard Abrams, Sylvia Falcon, Coleen Fitzgibbon, Anthony Haden-Guest and Walter Robinson. "The King Tut's Tomb of Downtown New York"
"It's All True": The East Village Eye Show draws from the nearly 4,000 pages, 3,000 photographs, sets of original copies and attendant materials that constitute the East Village Eye Archive. The quality and magnitude of this trove of cultural riches causes us to call it "The King Tut's Tomb of Downtown New York." April 1984 East Village Eye centerfold by Michael Roman. 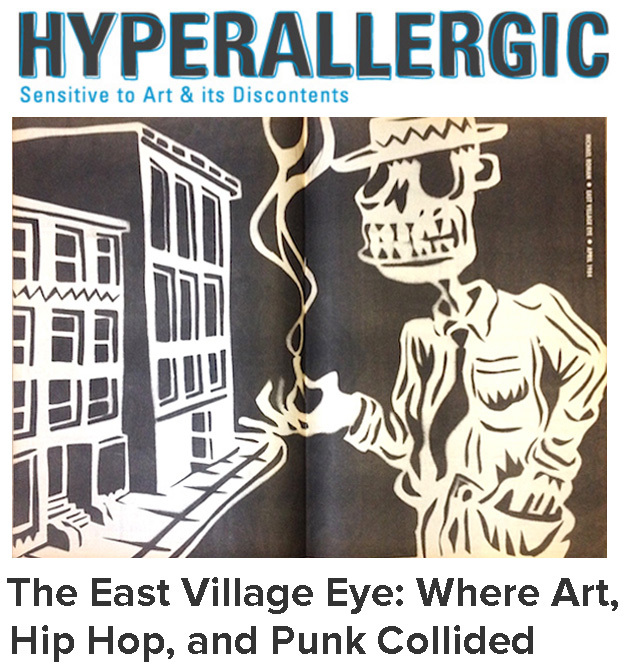 Hyperallergic, the highly followed and amazingly thorough website magazine about "art and its discontents," just published a thoughtful and solid piece about the Eye on Wednesday, November 12th, 2014. Author Tiernan Morgan charts the magazine's in-the-trenches coverage of the East Village art scene while not forgetting its precedents, influences and important concurrent movements. He throws in a little biographical info on editor/publisher Leonard Abrams as well, along with insightful quotes by first art director Christof Kohlhofer and art writer and scholar Yazmin Ramirez. Read all about it! On Thursday, Sept. 18th, 2014, The East Village Eye Archive, in conjunction with Printed Matter, Inc., presented the First "Officially Sanctioned" Back Issue Selloff, in which selected copies of the Eye were put on sale to the public…as well as the fabulous t-shirt designs sporting historical East Village Eye covers that you can also see at our store. To mark this big selloff event, we presented a mini-symposium entitled “How Hip Hop Came Downtown,” covering the process in which members of New York’s media and fine art communities brought rap music, graffiti art and breakdancing from the inner-city ghettos to a wider audience that has since spread across the world. Leading this discussion were Eye publisher/editor Leonard Abrams, musician and multimedia artist Michael Holman, scholar Yazmin Ramirez, and the celebrated artist and media figure Fab 5 Freddy. Guest appearances were made by author/journalist and Eye alumn Steven Hager, artist John Ahearn and photographer Lisa Kahane, all of whom added invaluable insights into the dynamics at play during this fertile time. Watch for video footage of the event coming here soon. Born Fred Brathwaite in NYC’s “Do or Die Bed Stuy,” Fab 5 Freddy has been making history and changing our world with groundbreaking contributions in music, film, art and cultural ambassadorship from the early 1980s to the present day. Fab took part in the tremendously influential Times Square Show in 1980, out of which he began his collaboration with Charlie Ahearn in the first film about hip hop, "Wild Style." A leading artist in the graffiti/aerosol/street art movement, Fab still found time to direct music videos and contribute to choice musical cuts like “Rapture,” “Change The Beat” and numerous other pop music hits. Today, as he continues to paint and exhibit, he also curates art shows, writes articles and hosts events showcasing key developments in the African Diaspora experience as it impacts the world. 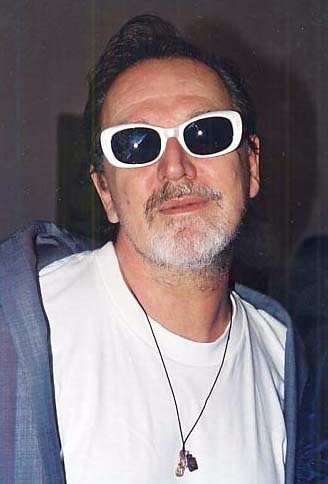 Michael Holman, the first writer to officially use the term hip hop in on the printed page (East Village Eye, January, 1982), has had a crucial hand in the popularization of culture that sprang from some of New York’s most underserved communities, from which he organized revolutionary breakdancers into The Rock Steady Crew and The New York City Breakers. He also created the first nationally syndicated hip hop television show, Graffiti Rock and promoted numerous other forms of nascent hip hop expression. 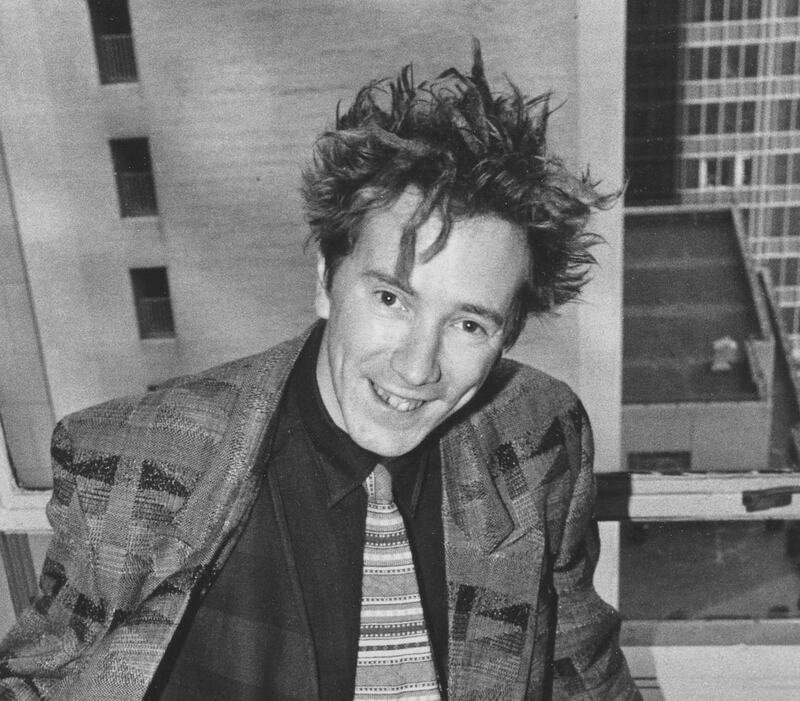 Holman, who was a founding member of the band Grey along with Jean-Michel Basquiat, later wrote the screenplay to the film Basquiat, recounting the seminal artist’s life and tragic end. Today, Holman teaches Mass Media at CCNY and continues to be active as an artist, writer and lecturer in the field of contemporary urban culture, film, theater and art. Yasmin Ramirez, Ph.D. is an art historian and independent curator. Growing up during the heyday of the Alternative Art Space Movement in New York, Yasmin Ramirez has worked at Taller Boricua, El Museo Del Barrio, The Studio Museum, The New Museum, Art in General, the Alternative Museum, Franklin Furnace and the East Village Eye. While at the Eye, she was instrumental in exposing the talents of young graffiti art pioneers to the recognized art world and beyond. She is currently writing a book based on her dissertation: Nuyorican Vanguards: The Puerto Rican Art Movement in New York. was a fun-filled event at the Lower East Side's Tammany Hall on December 9th. 2013. 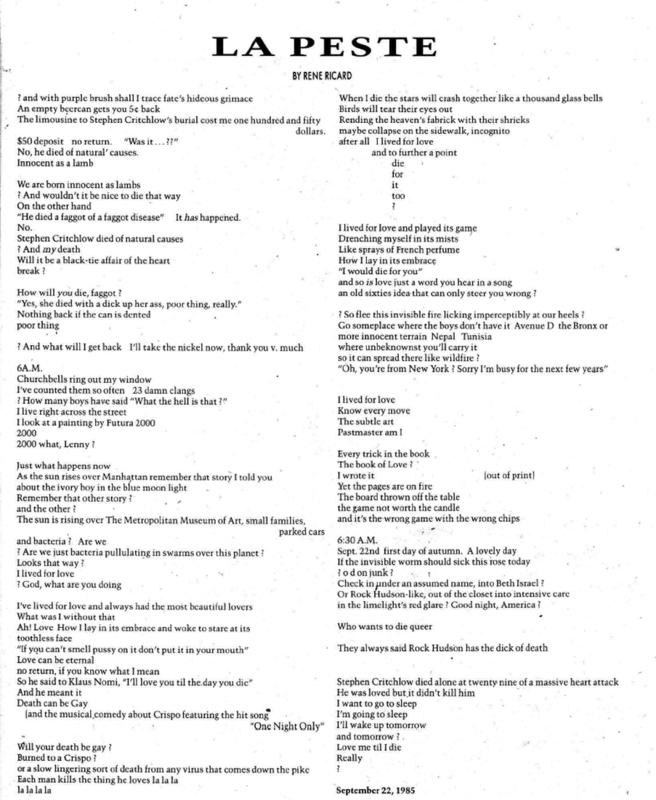 Unbeknownst to perhaps all in attendance, this was to be the last public performance of Rene Ricard's life. contributed to the Eye back in October of 1985. We miss you, Rene. and Brenda Bergman, plus spoken word by our dear departed Rene, along with Bob Holman, Max Blagg and Susana Sedgwick. which was preceded by a special screening of the legendary hip hop film "Wild Style" by Charlie Ahearn. 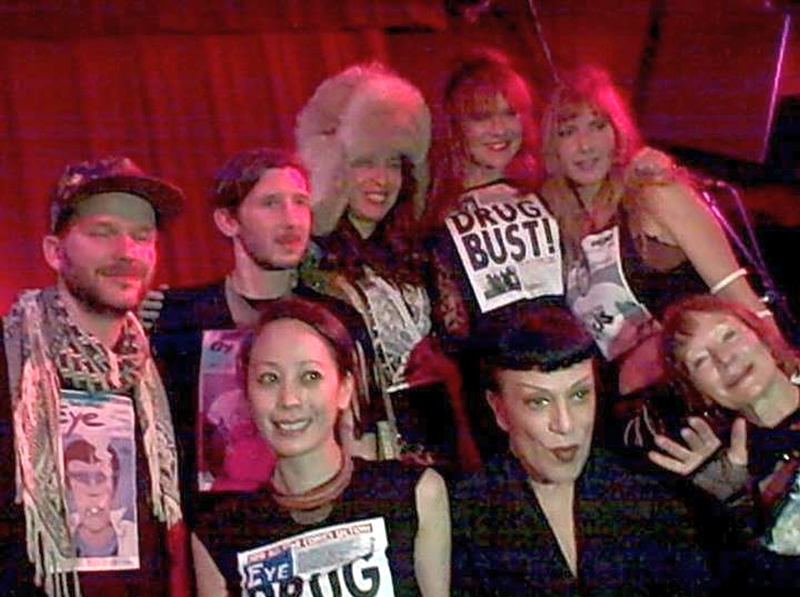 T-shirt fashion show director Evelyn von Gizycki (in fur hat) with models and host Joey Arias (in bangs).